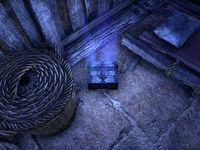 Finders Keepers: Thieves Troves are caches that are located all over Tamriel. They can only be opened by members of the Thieves Guild. Finders Keepers lets you open and loot Thieves Troves, found all over Tamriel. You receive the skill for free the first time you find one of these troves, which can only be opened when you have access to the Thieves Guild DLC. Alternatively, you'll acquire the skill during the quest Partners in Crime if you haven't found a trove by then. These troves have a distinctive blue glow, and produce an audible hum when you are near them, much like Nirnroot plants. Looting a trove is considered a crime, so be sure you are not witnessed opening it. Additionally, all of the contents will be marked as stolen, and will be confiscated if you are captured by the guards. In effect, acquiring this skill does nothing other than allow you to continue to open Thieves Troves even if your ESO Plus membership runs out and you lose access to the DLC. Thieves Troves are one of the easiest ways to find items in the Night Mother's Embrace set. Finders Keepers 5 Discover and loot 1 Thieves Trove. An Eye For Details 10 Discover and loot 5 Thieves Troves. Leave No Stash Behind 15 Discover and loot 15 Thieves Troves. This page was last modified on 26 August 2018, at 04:35.